A true classic, reinvented with a smoother drag, stronger gearing, and 6-pin centrifugal cast control! High-speed retrieve plus incredible system smoothness. 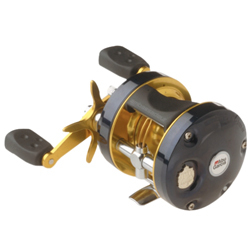 4 stainless steel bearings with Instant Anti-Reverse, nonslip spool, 6-pin centrifugal brake, coated levelwind, and advanced Carbon Matrix Drag. "I have 6 C4's and they all get a workout. I use them mostly for striped bass and bluefish, but have also caught tarpon, peacock bass, payara, and freshwater dorado. I go through 1-2 a year." "This is a great reel. I have pulled up several catfish from 4-6 pounds. i hooked one that was huge but my 25lb braid line snapped but my reel handled it great . This is a great reel. i have had almost no problems with this reel. " "Abu Garcia 5600 C4 is my favorite reel for bass fishing! I have 6 of them so far including the previous version with the line-out alarm clicker. Sure miss that feature on the new reels, but not enough to consider a different reel. " ""it is the smoothest round reel i have ever use in after a whole fishing trip in canada catching a ton of pike and muskie, a must buy reel."